"Diane de Groat's fun Halloween story (HarperCollins, 1998) involves a big brother, a little sister, and a pair of mixed-up costumes. 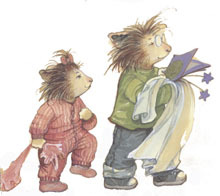 Gilbert the hedgehog can't wait to wear his Maritan space pilot costume, but when he gets to school he finds that a number of his friends have the same idea. To make matters worse, Lola's ballerina costume is inside his paper bag. Gilbert puts on a brave front when discovered in a pink tutu. Jason Harris and Peter Pamela Rose perfectly capture the voices of Lola and the school kids. The only jarring note is the narrators reading the signs in the illustrations (the names on the pizza shop, on the bathroom door, on the classroom door) in the middle of the narrative. An entertaining addition to readalong collections for young children."